Keeping your cellphone clean goes beyond eliminating viruses and malware because the actual phone itself can quickly become a cesspool of germs, bacteria and fingerprints. Before you place your phone in the washing machine on the gentle cycle, heed this advice for cleaning it without damaging its components. Touchscreen displays are incredibly useful and intuitive, but they can also accumulate a fair number of fingerprints and unsightly smudges. The best way to freshen up the display is by wiping it with a microfiber cloth using long, smooth strokes. It's best if you avoid using any liquids on the screen since they can damage the coating or even the internals. Don't use your shirt or a restaurant napkin either because these materials have fibers that can scratch the screen. While there are methods for getting rid of scratches, they are not foolproof so it's best to avoid scratching the screen on your smartphone in the first place. For nearly all the other parts aside from the touchscreen, you can clean your phone using a minimal amount of an alcohol solution. There are special cleaning products on the market, but they are largely unnecessary. Instead, mix isopropyl alcohol (rubbing alcohol) in a 40% concentration with water. Distilled water is preferable because it does not contain the chemical impurities of tap water which can leave streaks or a film on your phone when the water dries. Dampen a microfiber cloth or a cotton swab with the alcohol solution and squeeze out any excess solution. Gently clean the solid phone parts, including the individual keys on physical keyboards. Use the alcohol solution very sparingly since liquids of any kind can be harmful for electronics. Never use any sort of household cleaners, like Windex, since these products can also stain or damage your phone. Even when using straight water or the alcohol solution described above, never spray the liquid directly onto your cellphone. Spraying can force droplets of liquid into the internal components of your phone and cause corrosion and other damage. If you must use any liquid at all, apply it to a microfiber cleaning cloth or cotton swab and then use the cloth or swab to clean the phone. When you see dust, lint and other particles, as well as some smudges or fingerprints, you can remove a good amount using regular packing tape or clear tape. This is especially useful when a microfiber cleaning cloth is not available, and the method is simple. Wrap some tape around the fingers on your hand with the sticky side out. Proceed to dab or "roll" your fingers onto the surface of your phone to remove small debris. While many newer smartphones, like the Samsung Galaxy S6 and the Apple iPhone 6s, feature a completely sealed design, many cellphones still allow you to remove the back cover to access the battery, SIM card slot and microSD slot. If your phone allows access, remove the back cover when cleaning because a significant amount of debris can get into those little crevices. The method for cleaning the inside and edges of the back cover, as well as the exposed back of the phone, is the same as cleaning the other hard plastic parts of the phone's exterior. Turn off your phone, remove the back and take out the battery. Dampen a cotton swab slightly with a little distilled water and carefully clean the exposed surface. If the surface doesn't air dry almost immediately, gently dry it with a microfiber cloth right away to avoid damage. Reinsert the battery and put the back on the phone. 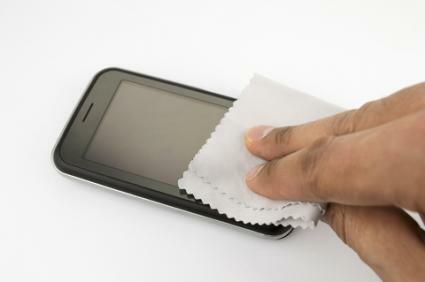 Just as cleaning the inside edge of the back cover is highly recommended, you should also clean any protective case you may use with your cellphone. Most cases can be cleaned with a damp cloth using the alcohol solution described above to help remove oils and fingerprints. Also clean the inside of the case since it makes direct contact with your phone. Killing the germs and bacteria that reside on and in your phone can be a challenge since using harsh chemicals or other cleaning solutions is not recommended. A cell phone sanitizer is a suitable alternative that uses short wavelength ultraviolet radiation. These devices shine the UV light on the surface of the phone, effectively eradicating most microscopic organisms. Several companies manufacture and sell such devices. 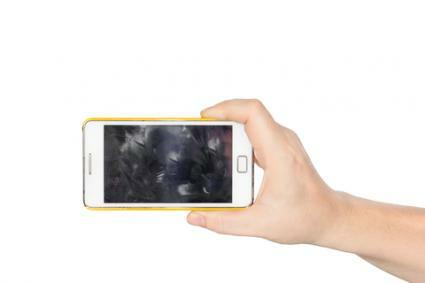 The PhoneSoap UV Smartphone Sanitizer costs about $60 and takes about four minutes to complete the sanitizing process. 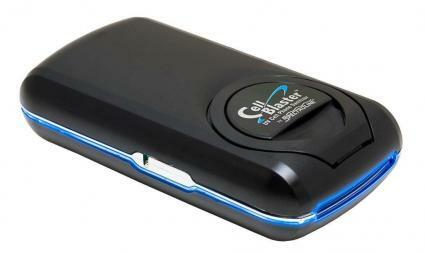 The CellBlaster Universal UV Cellphone Sanitizer retails for about $100 and can effectively eliminate over 99% of bacteria and viruses in about 30 seconds. Wipe the screen with a microfiber cloth as often as needed. Plan to give the phone a thorough cleaning about once a week. If you have a UV sanitizer, plan to sanitize the phone about every other week. According to Good Housekeeping, cell phones are actually dirtier than toilet seats. Considering how much more often a cell phone is used, coupled with the fact that it is placed next to your face, it is very prudent to keep your phone as clean as possible. Even an occasional wipe with a clean microfiber cloth can make a difference.